Take 35W North to the downtown exits, exit onto 11th St., go until Lasalle Ave and take a right, go one block to 10th St and take a right. go one block to Nicollet. Taking 35W South exit onto I-94 west. Immediately exit onto 11th St. , go until Lasalle Ave and take a right, go one block to 10th St and take a right., go one block to Nicollet, taking I-94 East exit onto 4th St, take a right onto Hennipen Ave. Go to 10th St., take a left, and go four lights to Nicollet. Taking I-94 West, exit onto 11th St. Go until Lasalle Ave. and take a right, go one block to 10th St. and take a right. Go one block to Nicollet. Take 394 W. to the downtown exits, exit onto 12th St., take a left on Lasalle, go two blocks to 10th St., take a right, and go one block to Nicollet. Located at the corner of 10th and Nicollet, parking is easily accessible via Minneapolis Public and Target store ramp below us. On-street metered parking is also available on 10th and surrounding streets. Nicollet Mall is reserved for public transportation, no parking or vehicle access permitted. 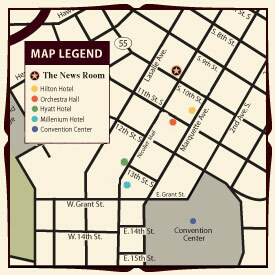 The News Room is conveniently located in the heart of downtown Minneapolis, right on the Nicollet Mall. We are just steps away from Orchestra Hall and centrally located between several downtown hotels. Going to a show? We are within a few blocks of The Orpheum, Pantages, and State Theaters.